I just heard of this from my friends Ay and Ty. 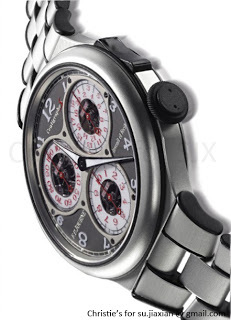 This is the most unusual FP Journe yet, the Centrigraphe Sport chronograph. The case and bracelet are in aluminium, with rubber covering the crown and rocker for the chronograph. Piece no. 1 will be auctioned at the end of May by Christie’s in Hong Kong with proceeds going to Japan earthquake relief. Based on the photo alone it reminds me of a Swatch aluminium.